professionals, informal carers and patients. The ACE study is a 3 phase mixed methods study, focusing on the experience and care of patients with dementia, chronic respiratory disease or cancer. Qualitative data will describe how admissions are understood and viewed, whilst quantitative data will provide a measure of attitudes, perspectives and intentions. 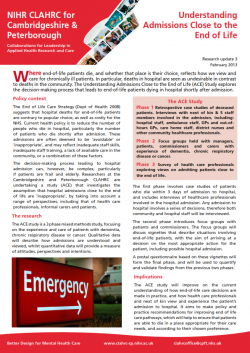 The ACE study will improve on the current understanding of how end-of-life care decisions are made in practice, and how health care professionals and next of kin view and experience the patient’s admission to hospital. It aims to make policy and practice recommendations for improving end of life care pathways, which will help to ensure that patients are able to die in a place appropriate for their care needs, and according to their chosen preference. We are undertaking the pilot phase of the ACE Study and have obtained Research Ethics and Research Governance approvals at all sites and are piloting Phase 1 in one hospital. Despite considerable logistical challenges we are finding clinicians are very willing to be interviewed, which augurs well for the main study.